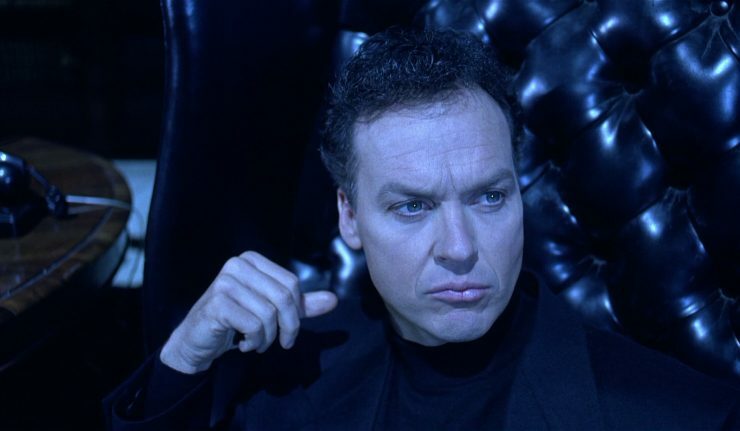 Former Batman actor Michael Keaton surprised Saturday Night Live audiences with his guest appearance as WikiLeaks founder Julian Assange, but Batman fans got a bonus surprise when Keaton directly quoted from the classic 1989 film. In the SNL cold opening, Keaton made a guest appearance as Julian Assange in prison. The Assange character compared just how much crazier he was than everybody else. When questioned by fellow cellmates, Keaton’s Assange dropped the classic line from Tim Burton’s Batman movie. Fans of the classic movie, will recognize that the actor is directly quoting himself. In the film, Keaton as Bruce Wayne is confronted by Jack Nicholson’s Joker. Bruce starts swinging a fireplace poker, while yelling the famous line in an attempt to scare off the Joker. Michael Keaton – if nothing else – is a super committed actor. Whatever role he takes, he transforms himself to fit it.